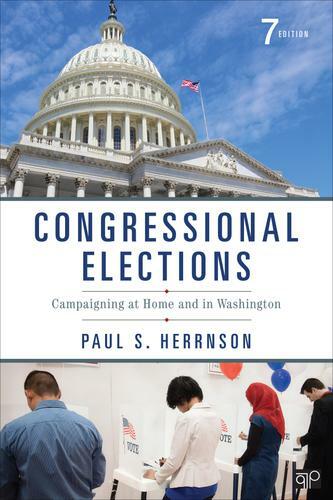 In Congressional Elections: Campaigning at Home and in Washington author Paul Herrnson combines top-notch research with real-world politics as he argues that successful candidates run two campaigns: one for votes, the other for resources. Using campaign finance data, original survey research, and hundreds of interviews with candidates and political insiders, Herrnson looks at how this dual strategy affects who wins and how it ultimately shapes the entire electoral system. The Seventh Edition considers the impact of the Internet and social media on campaigning; the growing influence of interest groups in the wake of the Supreme Court's Citizens United ruling; and the influence of new voting methods on candidate, party, and voter mobilization tactics.